Do you have questions about our Blue Sky charge controllers, or questions about solar in general? Give us a call at 1-800-472-1142. 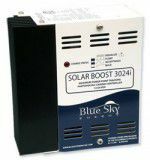 Blue Sky's low cost Solar Boost 3024iL provides a fully automatic 3-stage charge control system. Your battery will fully charge, and you will be ensured of enhanced battery performance with less maintenance. A partial IPA network interface is also included to allow use of the IPN-Remote or IPN-ProRemote displays. The user configurable auxiliary output can serve as either a 20 amp load controller, or as a 2 amp auxiliary battery charger. The load control feature can be used to limit excessive battery discharge in unattended remote systems. The auxiliary battery charge feature is ideal for charging a separate battery such as the engine battery in an RV. The auxiliary output can also provide fully adjustable dusk to dawn lighting control. Blue Sky Energy’s advanced Integrated Power Net™, or IPN Network, allows up to 8 IPN capable charge controllers to communicate with each other and operate as a single machine rather than separate charge controllers. The IPN network also allows networked controllers to share an optional battery temperature sensor and remote display. The IPN network does not require a display or other special hardware to operate. Blue Sky Energy, Inc. is a quality-driven, customer-oriented company. Their development of Maximum Power Point Tracking technology in 1998 led to the issuance of two patents. Their products are used worldwide to provide power in battery based or off-grid systems. Whether the system is a remote telecomm site, security camera, portable solar power system for the military, an RV or boat, Solar Boost products are selected because of their proven reliability, consistent quality and affordable prices. Blue Sky patented technology delivers up to 30% more power from your PV Modules than conventional solar charge controllers. What is the IPN Network? Blue Sky Energy created the Integrated Power Net™, or IPN Network to provide both a charge controller communication strategy as well as create the next generation of Solar Boost MPPT charge controllers. The advanced high speed digital network, allows up to 8 IPN capable charge controllers to communicate with each other and operate as a single machine rather than separate charge controllers. The IPN Network also allows networked controllers to share an optional battery temperature sensor and remote display. The IPN Network does not require an additional controller, display or other special communication hardware or software to operate.